We again invite all photographers worldwide to take part and to send us their unpublished photobook mock-up for the KASSEL DUMMY AWARD contest. In a first round, the best 50 books will be shortlisted by a jury at the end of April 2019. These books will be exhibited at several international photo events. From the shortlisted titles, 3 winners will be chosen by an international jury during Photo España in Madrid in June 2019. The book that wins will be produced and published by MAS, the leading Turkish photobook printing and binding house from Istanbul, in cooperation with the Fotobookfestival Kassel. Take your chance and enter your book by 24 April 2019! Have a look at our terms below. Of all the entries made we require physical printed books sent to us by the photographers/authors. From all the printed books, around 50 books will be selected for the exhibitions. The jury will choose the 3 winners from among these 50 exhibited books. The participants can additionally apply to dummy book reviews. The book that wins First Prize will be produced by the leading Turkish photobook printing and binding house MAS, Istanbul in cooperation with the Kasseler Fotografie Festival gUG, Kassel, Germany. The winners of the Second- and Third Prize will get a production voucher worth 2.000 and 1.000 Euro for future projects donated also by our partner MAS, Istanbul. Any photographer from around the world who accepts the following conditions can participate by registering for the competition and submitting an unpublished work as a physical book. All books published digitally or by self-publishing in small print-runs or through a photobook-publishing platform like blurb can be submitted. By accepting these conditions the participant states that the submitted work has never been published by a publishing house. • MAS Istanbul in cooperation with the Kasseler Fotografie Festival gUG reserves the right – in close consultation with the photographer – to decide the final print run of the first edition and to make changes to the size and additional features of the publisher’s dummy to optimize production, if necessary. • MAS Istanbul in cooperation with the Kasseler Fotografie Festival gUG shall bear the costs of production, project management and sales of the first trade edition. In return, the photographer shall waive his claim to royalties from the sale of the book and to any licence revenues from the first trade edition. Nevertheless the photographer will get around 50 free books for his own purposes from the first trade edition. Formally, a submitted work must adhere to the following photobook criteria: A photobook is a non-periodic collection of photographs printed (or reproduced on photographic paper) with text or even empty pages, with a binding and a cover. It can be made from paper or other suitable materials. There are no restrictions as to its content. It goes without saying that photographs are the major component of the book. Any format can be chosen, but to be eligible for the prize, certain production standards have to be adhered to. There are no size restrictions on the photobook dummy. Prerequisite for First Prize is a feasible book concept, meaning a book that can be produced through the typical production methods for a photobook. The final decision on its feasibility rests with the jury. Entries can only be registered online; click here to access the registration process. We charge € 36,00 per entry and book. There is no limit to the number of entries per person. If you would like your book to be returned to you, then we require a further postage and handling charge per entry. Postage and handling charge options are listed in the registration procedure. Payments can only be made via our Paypal account (also by credit card) online during the registration process. To avoid mix-ups, please enter the exact name of the author and the title of the book when paying the charges. After registration and transfer of the entry fee, you will be registered and receive an entry confirmation by E-mail. Registration closes on 24. April 2018. The latest arrival date for the Dummies at the festival office in Kassel is 24. April 2018. A preliminary jury chooses a maximum of about 50 book designs from the entries, which will be exhibited during various photographic events as announced. The main jury will select the prize winners at IED Madrid at the beginning of June 2019. Prizes will be awarded at IED Madrid on 7 June. 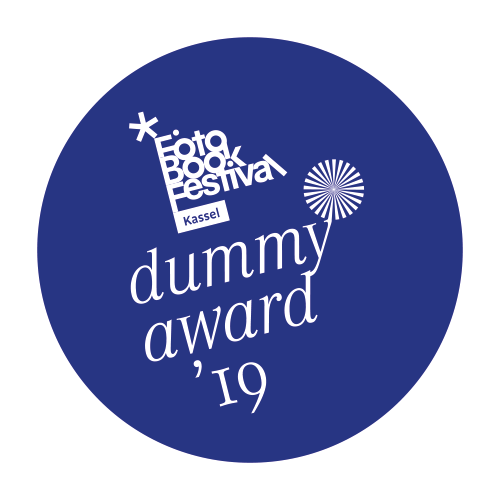 Dummies that make the shortlist will be shown during international photo events as announced. Because some of these events take place at the same time, we will request a second copy of the dummy. This second copy has to arrive at our Kassel office during April 2018, 10 days after the announcement of the shortlist. Should this not be available then, it will be omitted from some of the overlapping exhibitions. Should you like your book to be returned, then we will send it back to you within 6 weeks of the end of the entry period. The entrant will bear the costs for this. Postage and handling charge options are listed in the registration procedure. Returns will only be made after the return postage has been paid. We will require a further postage and handling charge per entry: within Germany € 8.00; within Europe € 15.00; all other countries € 18.00. The return of the book is only possible for books weighing up to 1,7 kg and not larger than 30x40x4 cm (WxDxH). Together with the entry confirmation, you will get a download-link for a reshipping form. This form has to be completed and put inside the book shipment. Please be aware that the back-shipping will be done by DHL International Book-Shipping Service where no shipment-tracking is available. Please do not send us return stickers, stamps, cash or similar items. Otherwise, the dummies will remain the property of the non-profit Kasseler Fotografie Festival gUG. We will handle all submitted works with the upmost care. However, because it is important to us that the dummies can be handled during the exhibition, they will have to be insured against theft. For this reason, all dummies will need to have a small hole on the back/cover (that is our job). Apart from that, we are not liable for damages, loss or books stolen during the exhibition and transports. The entrant declares that he/she is the owner of all copyright, usage-, application and other protection rights, or if he/she is not the owner of these rights – that he/she has the permission of the owners of these rights and is able to use them without a time or spatial limit and is able to transfer them. Given that this is provided for, the entrant transfers to the Kasseler Fotografie Festival gUG (haftungsbeschränkt) the right to selective publication in the media. Furthermore, permission is granted to publish and duplicate all submitted works during, and in the name of the Fotobookfestival Kassel through the Kasseler Fotografie Festival gUG (haftungsbeschränkt). An obligation to remunerate does not apply. The entrant also ensures that foreign rights, especially foreign copyright and similar regulations of the initiator, the entrant or any third parties, will not stand in the way of the above-mentioned transfer of rights. The entrant releases the Kasseler Fotografie Festival gUG (haftungsbeschränkt) from all possible claims on any legal grounds. Copyright and the above-mentioned usages of the photobook designs apart from the Kasseler Fotografie Festival gUG (haftungsbeschränkt) remain with the entrants and the authors. In addition please register our terms&conditions of our webshop. Entrants cannot exert direct influence over content, type and extent of the reproduction of their work in the festival program, the exhibitions or online. We ask for your understanding in this matter. By entering one or several works, each entrant agrees to the conditions and the selection process. The decision and judgments of the preliminary and final jury are final. Legal processes are excluded. In all instances of data processing (for example raising, processing and transmitting) we follow current law. Essential data that you have sent us for business transactions will be stored and forwarded to service providers as needed for the ordering process. Address and ordering details will only be used and processed for our own marketing purposes. We guarantee that we won’t forward your details to third parties. You can oppose the use, processing and transmission of your personal details at any time through a short informal note mailed to us at Kasseler Fotografie Festival gUG, Königstor 14a, 34117 Kassel or email to info@fotobookfestival.org. The following will then be the case for the processing of data for your order: Once we have received your objection, relevant data will not be used for anything but the use, processing and transmission of your order. Our offer is subject to change. Variations to internet images and details are possible. Contracts signed through us are bound to German law with the exception of the United Nations Convention on Contracts for the International Sale of Goods and the EGBGB. Where permitted, the sole place of jurisdiction is the Kassel Court. Individually liable: Kasseler Fotografie Festival gemeinnützige UG (haftungsbeschränkt), Königstor 14a, 34130 Kassel, AG Kassel HRB, CEO Dieter Neubert. Das Buch des Erstplatzierten wird von der Fotobuchdruckerei MAS in Istanbul produziert. MAS Istanbul trägt zusammen mit der Kasseler Fotografie Festival gUG die Kosten für Herstellung, Projektbetreuung, Vertrieb und Werbung des Buches. Die Zweit- und Drittplatzierten erhalten für den Druck ihrer Projekte einen Wertgutschein über 2.000 bzw. 1.000 Euro von MAS Istanbul. Jede/r, der/die folgenden Bedingungen akzeptiert und nach der Anmeldung auf unserer Webseite ein gedrucktes Fotobuch einsendet. Die Teilnehmer versichern mit ihrer Anmeldung, dass der eingereichte Dummy bisher noch nicht in einem Verlag veröffentlicht wurde. Selbstverlegte Bücher in kleinen Auflagen und Bücher von Online-Printplattformen wie Blurb u.ä. können hingegen eingereicht werden. • Das Buch wird von MAS Istanbul produziert und in Kooperation mit der Kasseler Fotografie Festival gUG publiziert. • MAS Istanbul und die Kasseler Fotografie Festival gUG legen die Auflagenhöhe der Erstauflage fest und behalten sich vor – in enger Absprache mit dem Fotografen – den Dummy für die produktionstechnische Optimierung ggf. in Umfang und Ausstattung anzupassen. • MAS Istanbul und die Kasseler Fotografie Festival gUG tragen die Kosten für Herstellung, Projektbetreuung, Vertrieb und Werbung des Buches. Im Gegenzug verzichtet der Fotograf für die erste Buchhandelsauflage auf Tantiemen aus dem Verkauf des Buches sowie etwaigen Lizenzeinkünften. Der Fotograf erhält ca. 50 Freiexemplare des Buches zur freien Verwendung. Formal muss jeder eingereichte Dummy folgenden Kriterien eines Fotobuches entsprechen: Ein Fotobuch ist eine mit einer Bindung und einem Umschlag oder Bucheinband versehene, nicht periodische Sammlung von mit Fotografien bedruckten (oder auf Fotopapier erstellten) sowie beschriebenen oder auch leeren Blättern aus Papier oder anderen geeigneten Materialien. Inhaltliche und formale Beschränkungen gibt es keine; dass Fotografien den wesentlichen Teil des Buches ausmachen, versteht sich von selbst. Voraussetzung zur Erlangung des ersten Platzes ist ein produktionstechnisch »machbares« Buchkonzept, das heißt ein Buch, welches industriell und nicht händisch herzustellen ist. Die letztliche Entscheidung über die herstellerische Machbarkeit fällt die Jury. Pro Buch ist eine Anmeldung notwendig. Die Anzahl der Anmeldungen pro Teilnehmer ist unbeschränkt. Alle Bücher der Shortlist werden auf verschiedenen internationalen Fotofestivals und Events ausgestellt. Da es vorkommen kann, dass sich zwei Ausstellungen zeitlich überschneiden, werden zwei Exemplare eines jeden für die Shortlist ausgewählten Dummies benötigt. Die Anmeldung und Entrichtung der Teilnahmegebühr kann ausschließlich online erfolgen, zum Anmeldevorgang gelangen Sie hier. Wir erheben pro Anmeldung und Buch eine Teilnahmegebühr in Höhe von 36,00 €. Die Anzahl der Anmeldungen pro Autor/Fotograf ist nicht begrenzt. Sollte eine Rücksendung des Buches/Ihrer Bücher gewünscht sein, ist für Porto und Verpackung ein weiterer Betrag pro Anmeldung fällig. Die verschiedenen Optionen sind während des Anmeldeprozesses wählbar. Sie können den Gesamtbetrag auf unser Konto ausschließlich online per PayPal (auch Kreditkarte) im Laufe des Anmeldevorgangs einzahlen. Dazu ist keine PayPal-Registrierung nötig. Geben Sie bitte bei Ihrer Zahlung als Verwendungszweck unbedingt den genauen Namen des Autors und den Titel des Buches an, damit es nicht zu Verwechslungen kommt. Nach Abschluss des Anmeldevorganges und dem Eingang Ihrer Teilnahmegebühr sind Sie angemeldet und bekommen von uns eine Bestätigung mit Teilnahmenummer per E-Mail. In dieser Bestätigung finden Sie auch alle weiteren Informationen zur Zusendung Ihres Buches sowie den Download-Link zum Rücksendeschein. Der Anmeldezeitraum endet am 24. April 2018. Spätestens am 24. April müssen die Bücher im Festivalbüro in Kassel angekommen sein. Eine Shortlist-Jury wird aus den eingesandten Werken eine Auswahl von ca. 50 Dummies treffen, die anschließend auf verschiedenen internationalen Fotografie-Events ausgestellt werden. Die Bekanntgabe der 3 Preisträger findet anlässlich der Photo Espagna am 7. Juni im IED Madrid statt. Alle Bücher der Shortlist werden auf verschiedenen internationalen Fotofestivals und Events ausgestellt. Da es vorkommen kann, das sich zwei Ausstellungen zeitlich überschneiden, werden 2 Kopien eines für die Shortlist ausgewählten Dummies benötigt. Diese 2. Kopie muss 10 tage nach der Bekanntgabe der Shortlist in unserem Büro in Kassel eintreffen. Möchten Sie Ihr Buch zurückhaben, schicken wir Ihnen dieses spätestens 4 Wochen nach Ende des Festivals zu. Sollte eine Rücksendung des Buches/Ihrer Bücher gewünscht sein, ist für Porto und Verpackung ein zusätzlicher Betrag pro Anmeldung fällig: innerhalb Deutschlands 8,00 € , innerhalb Europas 13,00 € , alle anderen Länder 18,00 €. ACHTUNG: Rücksendungen sind nur für Bücher mit einem maximalen Gewicht von 1,7 kg und Größe 30x40x4 cm möglich! Mit der Anmeldebestätigung senden wir Ihnen einen Link, mit dem Sie sich einen Rücksendeschein ausdrucken müssen. Dieser ausgefüllte Rücksendeschein muss dem eingereichten Buch beiliegen. Die Rücksendung kann ausschließlich über die Zahlung dieses Betrages erfolgen. ACHTUNG: die Bücher werden per DHL-Büchersendung zurückgeschickt, hierbei ist keine Sendungsverfolgung möglich. Bitte schicken Sie uns keine Rücksende-Aufkleber, Briefmarken, Bargeld o. ä.. Anderenfalls verbleiben die Bücher in Besitz der Kasseler Fotografie Festival gUG (haftungsbeschränkt). Wir und unsere Ausstellungspartner behandeln alle eingereichten Arbeiten mit größter Vorsicht. Da wir aber Wert darauf legen, dass die Dummies während der Ausstellung benutzbar sind, müssen sie gegen Diebstahl gesichert werden. Aus diesem Grund werden die Dummys u.U. von uns mit einem kleinen Loch und einer Öse im Rückdeckel/Umschlag versehen. Unabhängig davon können wir keine Haftung für beschädigte, verlorengegangene oder auf einer Ausstellung entwendete Bücher oder auf dem Versandweg abhanden gekommene Bücher übernehmen. Der Einsender versichert, Inhaber aller Urheber-, Nutzungs-, Verwertungs- und sonstiger Schutzrechte zu sein bzw. – soweit er nicht Inhaber dieser Rechte ist – die Einwilligung der Rechtsinhaber zu haben und über diese Rechte zeitlich und räumlich uneingeschränkt verfügen und diese übertragen zu dürfen. Dies vorausgesetzt, überträgt der Einsender der Kasseler Fotografie Festival gUG (haftungsbeschränkt) das Recht zur auszugsweisen Veröffentlichung in der Presse. Ferner erteilt er zusätzlich für alle eingesandten Arbeiten das Vervielfältigungs- und Vorführungsrecht im Rahmen und Namen des Fotobookfestivals Kassel durch die Kasseler Fotografie Festival gUG. Eine Vergütungspflicht besteht nicht. Darüber hinaus versichert der Einsender, dass fremde Rechte, insbesondere auch ausländische Urheber- und verwandte Schutzrechte sowohl des Auftraggebers, des Einsenders als auch Dritter der vorstehenden Rechtsübertragung nicht entgegenstehen. Er stellt die Kasseler Fotografie Festival gUG (haftungsbeschränkt) von eventuellen Ansprüchen, gleich aus welchem Rechtsgrund, frei. Das Urheberrecht und die über die genannten Nutzungen im Rahmen der Arbeit der Kasseler Fotografie Festival gUG (haftungsbeschränkt) hinausgehenden Nutzungsrechte an den Fotobuchentwürfen verbleiben selbstverständlich bei den Einsendern bzw. bei den Autoren. Darüber hinaus gelten die Verkaufs- und Zahlungsbedingungen unseres Webshops. Der Einsender kann keinen Einfluss auf Inhalt, Art und Umfang der Wiedergabe seiner Arbeit im Festival-Programm, in der Ausstellung oder im Internet nehmen. Wir bitten um Ihr Verständnis. Jeder Einsender unterwirft sich mit der Einsendung einer oder mehrerer Arbeiten den Bedingungen und dem Bewertungsverfahren. Die Entscheidung und Bewertung der Vor- und Hauptjury sind unanfechtbar. Der Rechtsweg ist ausgeschlossen. Bei allen Vorgängen der Datenverarbeitung (z.B. Erhebung, Verarbeitung und Übermittlung) verfahren wir nach den aktuellen gesetzlichen Vorschriften. Ihre für die Geschäftsabwicklung mit uns notwendigen Daten werden gespeichert und für die Bestellabwicklung im erforderlichen Umfang an von uns beauftragte und vertraglich gebundene Dienstleister weitergegeben. Adress- und Bestelldaten werden darüber hinaus nur für eigene Marketingzwecke erhoben und verarbeitet. Wir sichern Ihnen zu, Ihre Daten nicht an Dritte weiterzugeben. Der Nutzung, Verarbeitung und Übermittlung Ihrer personenbezogenen Daten zu Marketingzwecken können Sie jederzeit durch eine formlose Mitteilung auf dem Postweg an Kasseler Fotografie Festival gUG, Königstor 14a, 34117 Kassel. oder durch eine E-Mail an info@fotobookfestival.org widersprechen. Folgendes gilt dann für die zur Abwicklung Ihrer Bestellung erforderlichen Daten: Nach Erhalt Ihres Widerspruchs werden wir die betroffenen Daten nicht mehr zu anderen Zwecken als zur Abwicklung Ihrer Bestellung nutzen, verarbeiten und übermitteln. Unser Angebot ist freibleibend. Es können Abweichungen von den Internetabbildungen und -angaben vorkommen. Die mit uns geschlossenen Verträge unterliegen dem deutschen Recht unter Ausschluss des UN-Kaufrechts und des EGBGB. Soweit rechtlich zulässig gilt als ausschließlicher Gerichtsstand das Amtsgericht Kassel.